This article is about the novel. For the 1992 film, see Howards End (film). For the 2017 BBC/Starz miniseries, see Howards End (miniseries). Howards End is a novel by E. M. Forster, first published in 1910, about social conventions, codes of conduct and relationships in turn-of-the-century England. 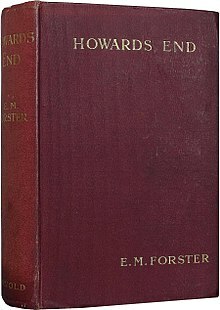 Howards End is considered by some to be Forster's masterpiece. The book was conceived in June 1908 and worked on throughout the following year; it was completed in July 1910. In 1998, the Modern Library ranked Howards End 38th on its list of the 100 best English-language novels of the 20th century. The story revolves around three families in England at the beginning of the 20th century: the Wilcoxes, rich capitalists with a fortune made in the colonies; the half-German Schlegel siblings (Margaret, Helen, and Tibby), whose cultural pursuits have much in common with the Bloomsbury Group; and the Basts, an impoverished young couple from a lower-class background. The idealistic, intelligent Schlegel sisters seek to help the struggling Basts and to rid the Wilcoxes of some of their deep-seated social and economic prejudices. The Schlegels had briefly met and befriended the Wilcoxes when both families were touring Germany. Helen, the younger Schlegel daughter, then visits the Wilcoxes at their country house, Howards End. There, she is romantically attracted to the younger Wilcox son, Paul; they become engaged in haste but soon regret their decision. The engagement is broken off by mutual consent. Later that year, the Wilcoxes move to London, taking an apartment close to the Schlegels'. Margaret Schlegel befriends the Wilcox matriarch, Ruth. Howards End is Ruth's most prized possession; she feels a strong connection to it. Her husband and children do not share her feelings for the old house. Perceiving that Margaret is a kindred spirit, so while on her deathbed, Ruth decides write a note to bequeath Howards End to Margaret. When the widowed Henry Wilcox reads this note, it causes him great consternation. Henry and his children burn the note without telling Margaret about her inheritance. A few years later, Henry Wilcox and Margaret Schlegel renew their acquaintance. Their friendship blossoms into romance and Henry proposes to Margaret, who accepts. It is apparent that their personalities could not be more different. The courageous, idealistic, compassionate, high-minded and romantically inclined Margaret tries to get the rigid, unsentimental, staunchly rational Henry to open up more. Henry's children do not look upon her engagement to their father with a friendly eye. But the only real opposition comes from Charles and his wife Dolly; as they fear that Margaret endangers their inheritance to Howards End. Leonard is living with but not married to Jacky, a troubled, vulnerable "fallen" woman for whom he feels responsible. Helen continues to try to help him, ostensibly out of guilt for having interfered with his life in the first place for making him quit his job, but also perhaps because she is secretly attracted to him. Helen soon encounters the starving Basts, and brings them to Evie Wilcox's wedding celebration, whereupon Henry recognizes Jacky as his former mistress. He flees from the scene, breaking off his engagement to Margaret. His first thought is that the Schlegels and Basts have concocted a plot to expose him, but he later calms down and tells Margaret the truth. Ten years previously, when he was on business in Cyprus, despite being married, he seduced Jacky and then carelessly abandoned her. Margaret, dreadfully disturbed by this, confronts Henry about his ill-treatment of Jacky. Henry is deeply embarrassed and ashamed about this. Such are the ways of the world, to his mind. Margaret, for various reasons, wishes to save the relationship and forgives him. The Schlegel sisters drift apart, partly because of Margaret's impending marriage into the Wilcox family, partly because of Helen's profound disapproval of Henry's treatment of the Basts. Much distressed by what she has heard from Leonard about the circumstances of Henry's acquaintance with Jacky in Cyprus, she is overwhelmed by love and pity for him; she sees Leonard as a strikingly altruistic and romantic figure. Helen and Leonard are thrown together in an atmosphere of great anguish and succumb to their feelings of mutual passion. Finding herself pregnant, Helen leaves England, travelling to Germany to hide her condition, but she later returns to England upon receiving news that Aunt Juley is ill. She refuses to meet her sister Margaret, who, following Henry's suggestion, had traveled to Howards End. Having correctly guessed that Helen would wish to retrieve them, she surprises her sister by appearing unannounced. Henry and Margaret had planned an intervention with a doctor, presuming Helen's evasive behavior was a sign of emotional instability or mental illness. As soon as they encounter Helen at Howards End, they see the truth. Margaret decides it is her duty to stand by her sister and help her. She tries in vain to convince Henry that if she can forgive him his transgression, he should forgive Helen hers. Henry, indignant, remains unconvinced. Leonard arrives at Howards End, still tormented by the affair and wishing to speak to Margaret. He is not aware of Helen's presence, having lost contact with her. Charles Wilcox then bursts upon the scene and in an effort to ingratiate himself with his father, attacks Leonard for purportedly "insulting" Helen. He strikes Leonard with the flat edge of a heavy old German sword. Leonard grabs onto a nearby bookcase, which collapses on top of him. Due to un-diagnosed heart disease, he dies on the spot. Margaret informs Henry of her intention to leave him. Charles Wilcox is found guilty of manslaughter and sentenced to three years in prison. The scandal and its repercussions have a profound effect on Henry, causing him to take a good look at his life and examine his conscience. He learns the value of empathy and begins to connect with others. Writing a new will, he bequeaths Howards End to Margaret, as his first wife Ruth had wished. He further stipulates that, after Margaret's death, the property will go to her nephew, the son of Helen and Leonard. Helen is warmly reconciled with Margaret and Henry. Fully supported by them, she decides to bring up her son at Howards End. The scene of the tragedy is revealed as a place of poetic justice and redemption. Margaret has resolved the conflict by making a complex, thoughtful, remarkably noble moral choice to stand by her sister, while at the same time reversing her decision to leave her husband. Indeed, by staying married to Henry, lovingly supporting him through his hour of need, she acts as a uniting force, bringing all the elements peacefully together. Leonard Bast's son with Helen is set to inherit Howards End from the Wilcox family, making some amends for the tragedy. Forster based his description of Howards End on a house at Rooks Nest in Hertfordshire, his childhood home from 1883 to 1893. The house, known in Forster's childhood as "Rooksnest" had, as in the novel, been owned by a family named Howard, and the house itself had been called "Howards" in their day. According to his description in an appendix to the novel, Rooks Nest was a hamlet with a farm on the Weston Road just outside Stevenage. The house is marked on modern Ordnance Survey maps at grid reference TL244267. The area to the north west and west of Rooks Nest House is the only farmland remaining in Stevenage (the area to the east of the house now comprises the St Nicholas neighbourhood of the town). The landscape was termed "Forster country" in a letter to The Times signed by a number of literary figures, published on 29 December 1960. The letter was written in response to two compulsory purchase orders made by the Stevenage Development Corporation; it expressed the hope that 200 acres of countryside around the house could be preserved both as one of the last beauty spots within 30 miles of London and "because it is the Forster country of Howards End." In 1979, the centenary of the author's birth, the area was officially named the Forster Country by local planners after efforts by a campaign group, the Friends of the Forster Country, which aims to preserve the landscape that Forster knew for future generations. In 1997, a sculpture marking Forster's connection with the area was unveiled beside St Nicholas churchyard by the MP for Stevenage, Barbara Follett. In September 2017 Rooks Nest house was put up for sale. Wickham Place, the London home of the Schlegel sisters, was demolished to make way for a block of flats; it did not have a direct real-world counterpart. Forster's conception of it owed a great deal to number 1 All Souls Place, where the sisters of Goldsworthy Lowes Dickinson lived. A stage adaptation by Lance Sieveking and Cottrell, was performed in 1967 on tour and at the New Theatre in London, with Gwen Watford, Gemma Jones, Michael Goodliffe, Joyce Carey and Andrew Ray in the cast. Forster co-operated in the production. The Inheritance by Matthew Lopez, a two-part stage adaptation opened in March 2, 2018 at Young Vic. It gets inspiration from the Forster novel to portray instead the generation that came after the height of the AIDS crisis, addressing the life of a young gay man in New York. Actors: Hugo Bolton, Robert Boulter, Andrew Burnap, Hubert Burton, John Benjamin Hickey, Paul Hilton, Samuel H. Levine, Syrus Lowe, Michael Marcus, Vanessa Redgrave, Kyle Soller, Luke Thallon, Michael Walters. A British television adaptation of the novel in the BBC's Play of the Month series was broadcast in 1970, and starred Leo Genn, Sarah-Jane Gwillim, and Glenda Jackson. In November 2017, a four-part adaptation by Kenneth Lonergan was broadcast by the BBC. It was a co-production with US broadcaster Starz. A film version made in 1992 stars Emma Thompson, Vanessa Redgrave, Helena Bonham Carter, Anthony Hopkins, and Samuel West. Thompson won an Academy Award for her performance. In 2009, a two-part adaptation by Amanda Dalton was broadcast on BBC Radio 4, with John Hurt as the narrator, Lisa Dillon as Margaret Schlegel, Jill Cardo as Helen Schlegel, Tom Ferguson as Tibby Schlegel, Alexandra Mathie as Aunt Juley, Malcolm Raeburn as Henry Wilcox, Ann Rye as Ruth Wilcox, and Joseph Kloska as Charles Wilcox. Claudia Stevens' opera libretto Howards End, America (2016) moves the action to 1950s Boston. The adaptation is discussed in Stevens' article "Page to Stage: A New Opera, Howards End, America" in the Polish Journal of English Studies. ^ Trilling, Lionel (1965). E. M. Forster. New York, NY: New Directions. p. 114. ISBN 0811202100. ^ "Appendix: Rooknest" in Howards End, Penguin Books. ^ The letter says, "Literate people the world over feel that it [Forster country] should be preserved in its original setting as one of our greatest literary landmarks." It was signed by W. H. Auden, John Betjeman, Sir Arthur Bryant, Lord David Cecil, Graham Greene, John G. Murray, Harold Nicolson, Max Reinhardt, Dr C. V. Wedgewood, and Vita Sackville-West. Authors Fear Threat To 'Forster Country’. The Times [London, England] 28 Dec. 1960: 10. The Times Digital Archive. Web. 29 Nov. 2017. ^ "The Forster Country—The Fame of Forster Country". The Friends of the Forster Country. ^ McEvoy, Louise (21 September 2017). "Stevenage childhood home of author E M Forster goes on the market for £1.5 million". The Comet. Retrieved 21 November 2017. ^ "The childhood home of novelist E. M. Forster goes up for sale – Country Life". Country Life. 20 October 2017. Retrieved 28 November 2017. ^ "'HOWARDS END'; Forster's Sisters". The New York Times. 12 April 1992. ISSN 0362-4331. Retrieved 28 November 2017. The two Miss Schlegels are a sort of blending of the three Miss Lowes Dickinson (G. L. D.'s sisters) whom I saw in passing when we were all young. Wickham Place is their house, 1 All Souls' Place, since destroyed, not far from Queens Hall. ^ 1 All Souls Place was built by G.L. Dickinson’s portraitist father Lowes Cato Dickinson in 1877–9. Forster writes of the building as ‘a tall dark red wedge-shaped house all windows and hospitality, and it was there that I saw him once or twice towards the end of his life. He was then nearly ninety and he walked around the rooms with a candle to show me some pictures which he thought would give me pleasure.’ Forster, E. M. (1934). Goldsworthy Lowes Dickinson. Edward Arnold. p. 3. ^ "BBC – All-star cast announced for Kenneth Lonergan's adaptation of Howards End for BBC One – Media Centre". www.bbc.co.uk. ^ Andreeva, Nellie. "Starz Boards 'Howards End' BBC Limited Series; Hayley Atwell, Matthew Macfadyen & Tracey Ullman To Star". Deadline. Retrieved 15 February 2017. ^ "EM Forster – Howard's End – BBC Radio 4 Extra". BBC. ^ "Claudia Stevens Papers, 1967– ongoing". scdb.swem.wm.edu.